Note: Click the image to view the full article as a large JPG image. Click here for the PDF file version. 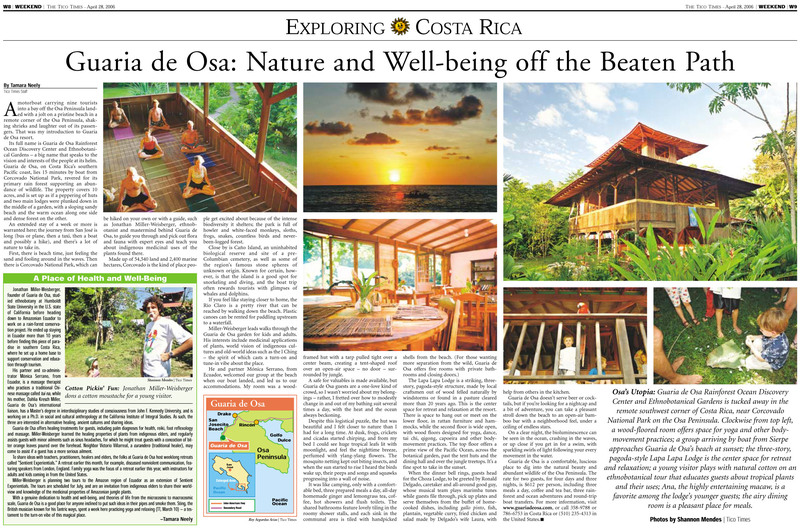 Reprinted with permission of The Tico Times. don Victorio Villareal Villareal – one of a kind; a priceless tesoro nacional. Dahlia Miller – who 'buttons up' our journey before we arrive! "Jonathon! What good magic here at Guaria de Osa! Presided over by a most benevolent array of plant energies and animal intelligences, leafing and leaping spirits, laughing under a gazillion gleaming stars, accompanied by the steady drumbeat, like a dark heart of the wave on the sloping strand in wilderness and wonder." — DAVID ABRAM, author of "The Spell of the Sensuous: Perception and Language in a More-Than-Human World"
"Very much enjoyed our Guaria experience! We did a 'Mr. & Mrs. Fish' performance at the local school to celebrate Earth Day. Being here was a most special adventure, one we will always remember. Thanks to Jonathon and Monica and the entire staff! 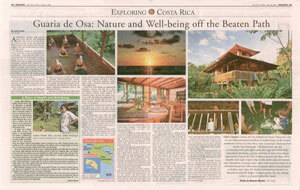 You've created a marvelous space to relax and enjoy the Rainforest and the Ocean. Muchas gracias." — DEB & JEFF SANDLER - 'Mr. & Mrs. Fish' – marine biologists and educators; internally acclaimed, award winning marine educational program, Maine. "For Jonathon! Thanks for your work in the world! With best wishes." — JEREMY NARBY, author of "The Cosmic Serpent, DNA, and The Origins of Knowledge"